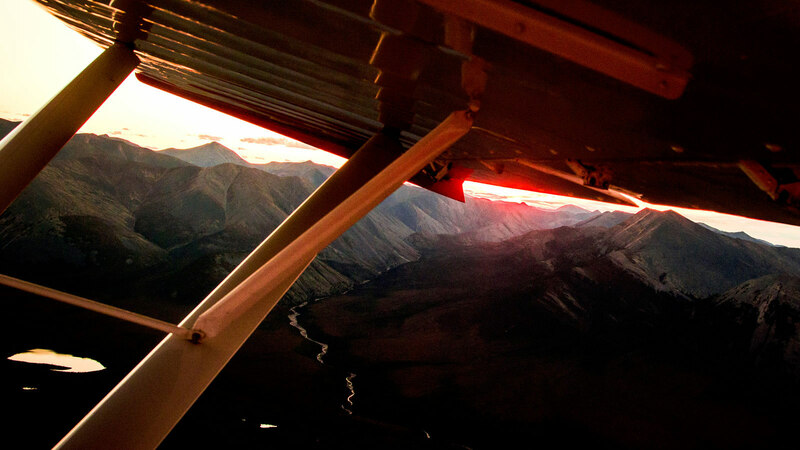 It was late afternoon on the sixth day of my 10-day combo hunt for moose and Dall sheep with Arctic Red River Outfitters. Strangely, I found myself resting comfortably in base camp. My feet were propped up on a wooden bench a few feet from a small stream and my hat brim slid down over my nose shading the folded arms of pure relaxation. That warm afternoon in the Northwest Territories, nothing but the sound of the stream seemed to matter. 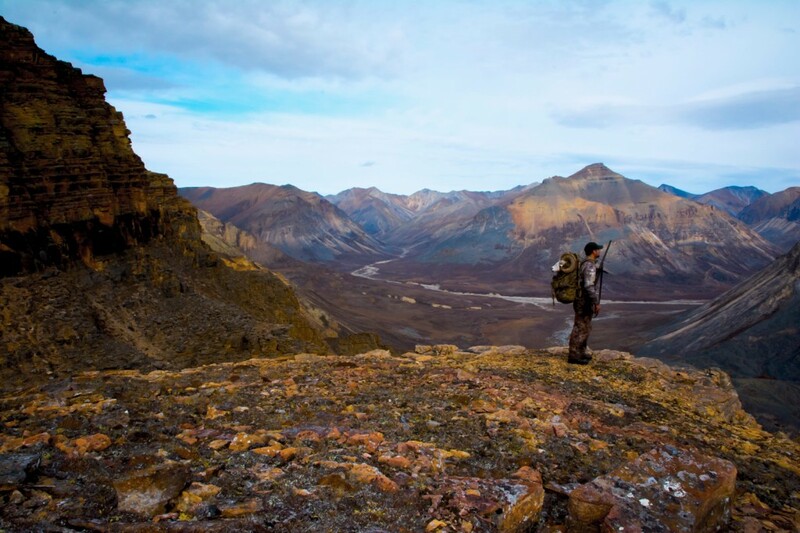 For 20 years I planned, saved, and dreamed of hunting moose and sheep at Arctic Red. Every spare moment and spare dollar was dedicated to that dream and finally, I was there! Three days prior, I had crossed paths with a fantastic bull moose on the north end of the Mackenzies. He had wide sweeping palms and huge fronts with 5 points on each brow. I found that old bull in a narrow valley about three miles from spike camp, and had spent the last two days backpacking over 800 lbs of moose meat through the swamp and willows. After that, every ounce of me, from my sore shoulders to my blistered feet, was enjoying the bench seat and the sound of that small stream. The original plan with my outfitter and friend, Tavis “Tav” Molnar, was to continue the hunt for Dall sheep immediately after hunting moose. Unfortunately, that afternoon there was no certainty my hunt would continue at all. Just the day before, I learned that one of the guides at Arctic Red was headed to the hospital with a broken leg and the outfit was in a scramble to shuffle available guides around. With my moose hunt over, I was moved back to base camp while Tav tried to coordinate a replacement guide in time for me to continue the hunt for sheep. oat-plane. 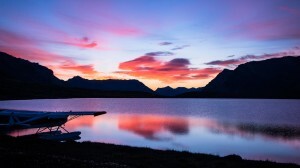 Photo 3: Tethered boat-plane in the heart of the Arctic Red. Tav and I have been good friends for 20 years. Our friendship started when he guided me on a caribou hunt at Arctic Red in 1993. Now, as we loaded our gear in the Bushmaster float-plane I was thinking, “What an adventure this will be! My outfitter, guide, pilot, and friend are all rolled into one.” Tav hadn’t guided a hunter in the seven years since he took over the outfit and even though the logistics of running the business were weighing on him, we both knew that this opportunity to hunt together was a rare gift. 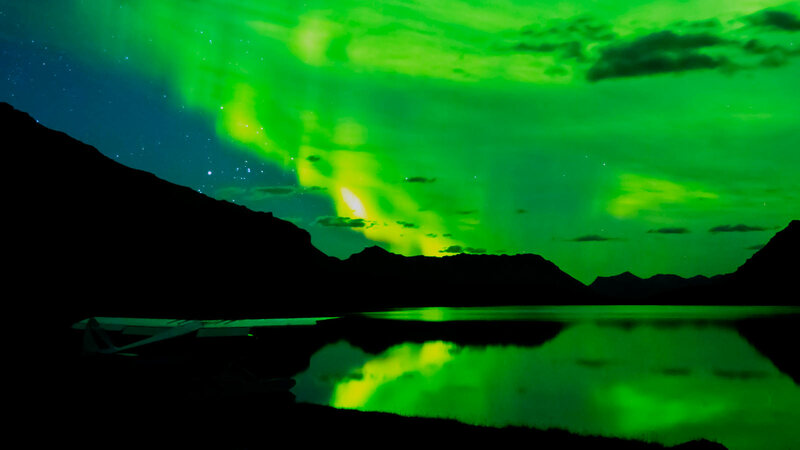 We made camp near the lake that evening and witnessed a brilliant show of the Northern Lights. Twisting bands of emerald green stretched across the horizon and seemed to fall over the mountains like rain. They backlit the spine of the Mackenzies and filled the jaws of the canyon below. 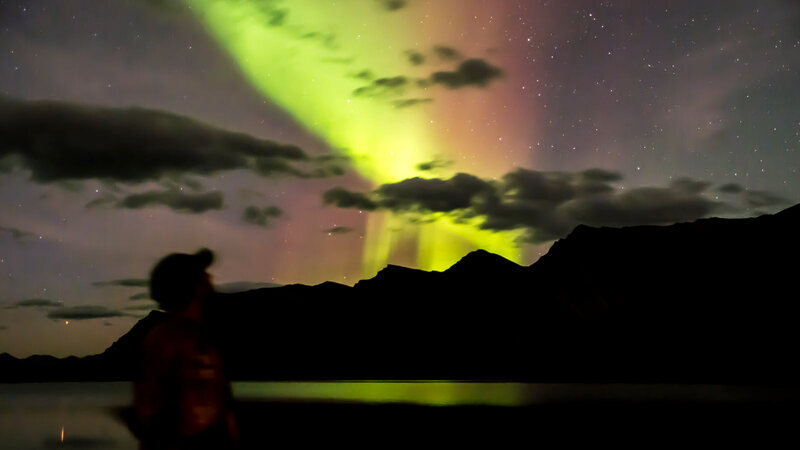 I felt like I was standing outside myself, witnessing my own dream and wasn’t sure if the aurora was a welcome, or warning, from the mountains. Either way, I knew I was in for an adventure. A few hours later, the aurora faded to a frosty morning cold enough to sting my nose with each breath. With the sky still gray in the east, Tav and I shifted gears from a morning slumber to strong purpose and we headed east around the lake. Our boots, perfectly in line, left one set of moist tracks in the frosted tundra as we headed toward a crowned valley lined with steep cliffs. Ram country! 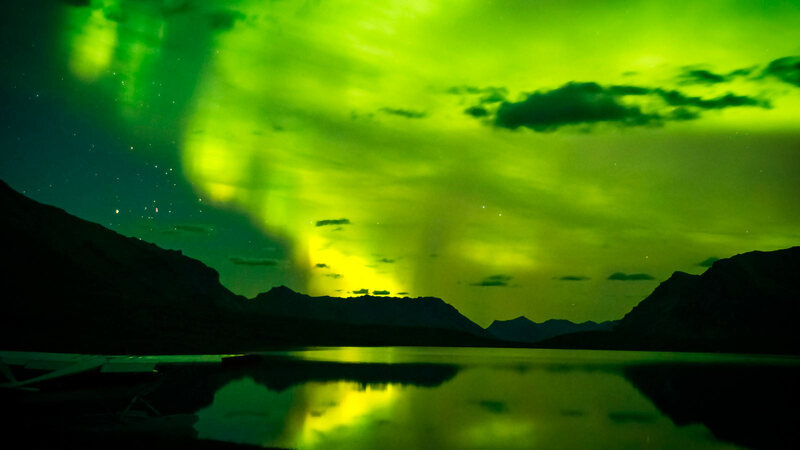 The Aurora Borialis lights up the Spine of the Mackenzies. 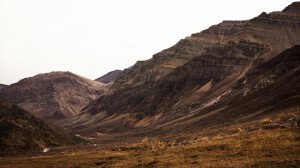 We traveled up the valley for a couple miles, and spotted three young rams and a group of caribou bulls along the way. 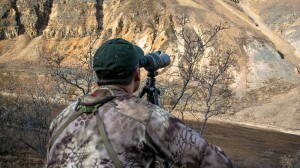 We were following a caribou trail near the stream bank when Tav paused and raised his binoculars. I followed his gaze, but didn’t pick out anything unusual. He was intently glassing a steep band of cliffs far up the valley and calmly whispered, “Yep.” I noticed a smirk on his face and knew exactly what “Yep”, meant. At over a mile, Tav had spotted the back line of a feeding ram. 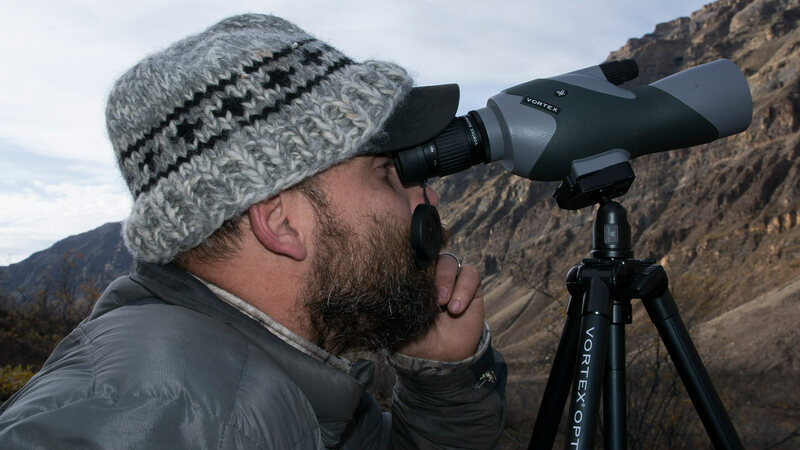 There’s no substitute for the eyes of an experienced sheep guide. We cautiously made our way along the stream, using the willows as cover and moved up the valley to a vantage point on the opposite slope. We could just see the head of the now bedded ram and Tav began studying him through my spotting scope. At Arctic Red, the goal is to take rams 10 years old or older and I was resigned to wait patiently for Tav’s verdict on this one. We immediately began scanning the mountain for possible stalking routes but found only one. The ram was feeding on a ledge, three-quarters of the way up the opposite slope and from our vantage, the ram’s home seemed like a citadel. Our only option was a stalk straight up the ridge directly under the ram. 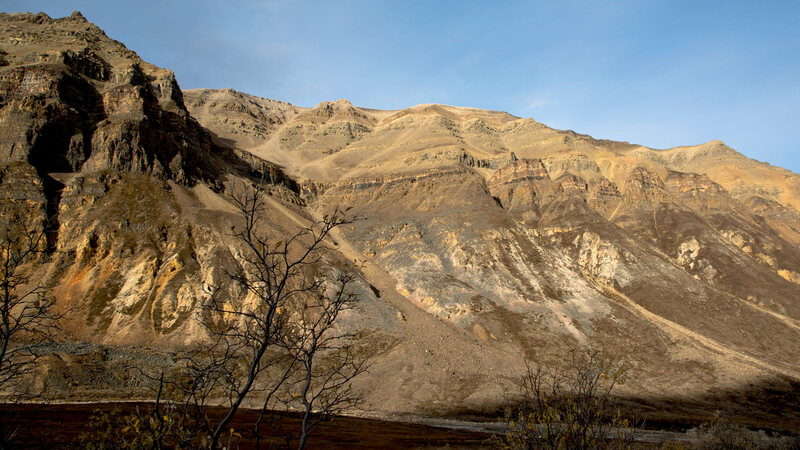 Unfortunately, jagged cliffs on either side would force us to hold that line and negotiate some loose shale slides and near vertical walls. About half way up the slope, Tav let me move ahead and I took my time quietly moving rocks out of the way for each step. Every ounce of me was focused on being quiet. In places, I had to slide the rifle up on rock shelves above me and inch my way up rock crevasses. Every few steps, I would pause and listen for the sound of falling rocks that could mean the ram had heard me and spooked. Photo 1: Sunrise on the morning of the sheep hunt. Photo 2: Sheep Country! Photo 3: My Sheep is on that ridge. Can you see him? The stalk was slow and it was mid-day before I crested the cliff where we had last seen the ram. Quietly, I chambered a round and began searching. 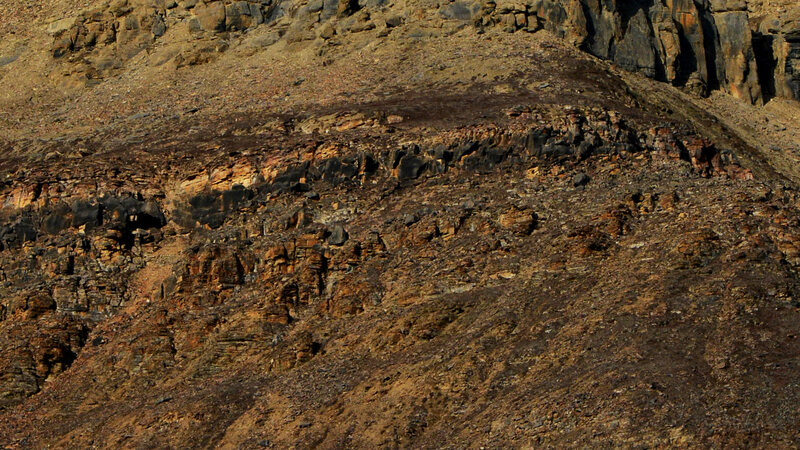 I scanned up the talus slope and through the maze of jagged cliffs on either side. The ram was nowhere above me. I could see the empty ledge where he had spent the day and with each step, I was losing hope that the he was still on the mountain. Just as I began to think he must have spooked out long before I made it up the cliff, I glanced to my left. 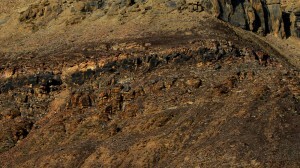 There, just over the roll of the ledge and only 25 yards away, was the unmistakable curve of sheep horns. My eyes were focused on the ram’s ears, watching for any movement that would indicate he had heard me. Holding my breath, I slid the safety forward and slowly raised the rifle. 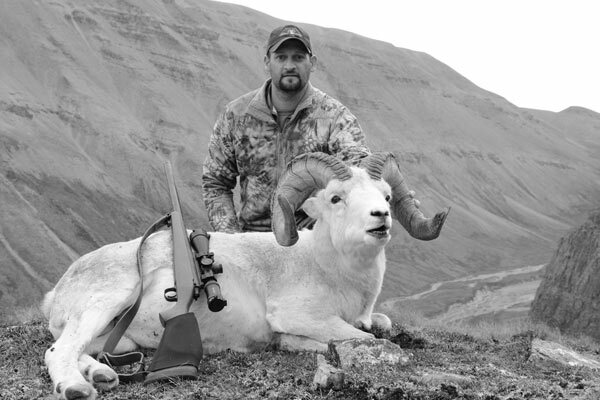 In that moment the weight of a 20-year quest lifted and the crosshairs settled on the rams shoulder. He never stood from his bed. at’s a very fine, very old ram.” Photo 2: Grazing just above the angled cliff just to the leftof the center of the picture. Photo 3: Planning the stalk. They live hard lives in hard country and this ram’s horns showed the wear of 13 years in the Mackenzies. Chipped and broomed off by countless battles, those horns reminded me of the long road that led me up that mountain. I was chipped and broomed off a little myself over my 20-year quest. Much like this old ram, I stood on that cliff overlooking where I had come from. 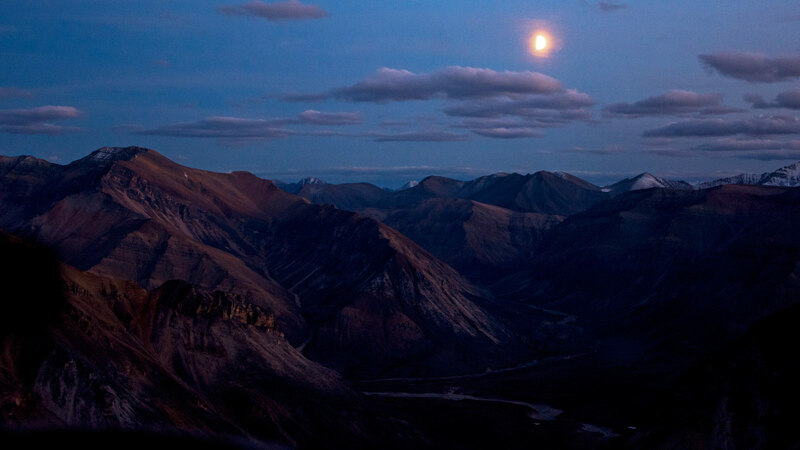 Not just the valley below, but the years of dreaming and the last days of circumstance that lead me up that ridge. I realized then that this ram was more than a trophy. He embodied everything that is wild and untamed in the mountains and why I am a hunter. 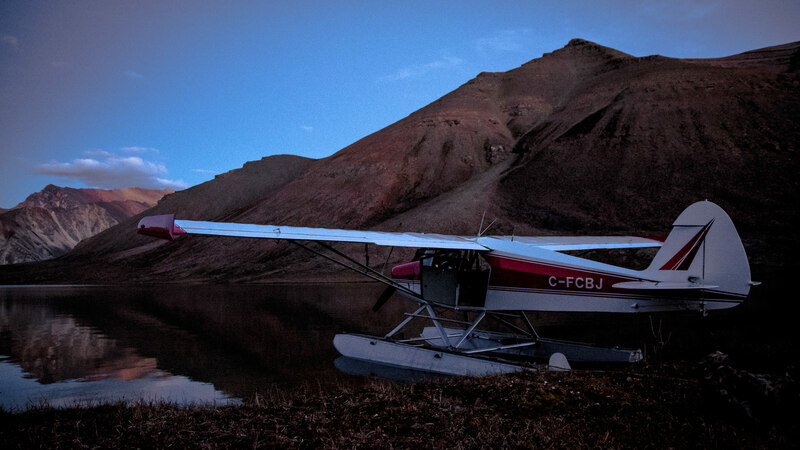 I extend a special thank you to my friend Tavis Molnar and all the staff at Arctic Red River Outfitters for one of the greatest adventures of my life. I would also like to thank PROOF Research, Kryptek Outdoor Group, Vortex Optics, Kifaru International, and Wilderness Athlete for the hunting and backpacking gear provided to help make this hunt possible. Finally, thank you to my friends and family. Without your support, I could never climb these mountains. This entry was posted in Afield. Bookmark the permalink.